Now, just like you, I too typed that all too common search term in Google a couple of years ago. Low and behold, one of the first results I found was a simple, yet effective tutorial by my buddy Toby Harriman, owner of Planet Unicorn. I am going to take some of the lessons from his tutorial and expand on them here. You put on the wool cap and the puffy down jacket to head out of your house, and just as you make it to the car, you realize you forgot your tripod inside. 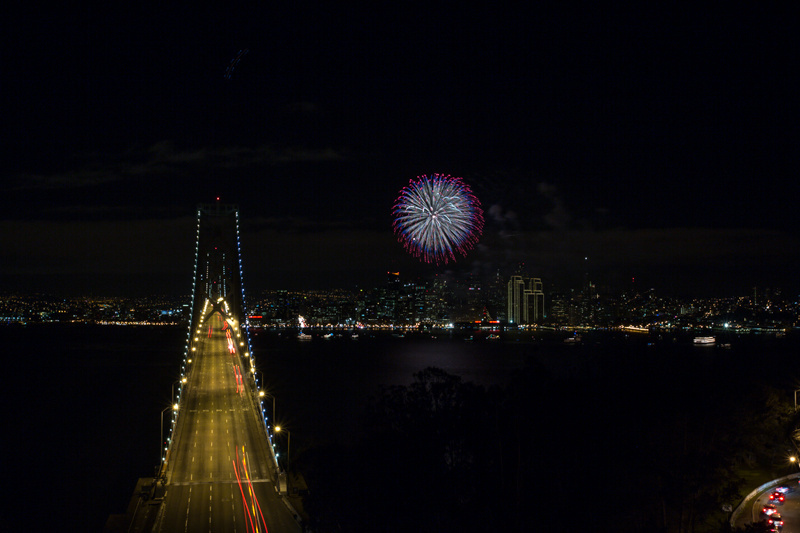 Well, don't forget your tripod, because you can't take photos of fireworks without one. Tripod in hand, you get to the location of your dreams, and after elbowing a couple other photographers, secure your place by expanding those tripod legs. The first thing you want to do is capture your background photo of the city skyline (or whatever scene is in front of you). 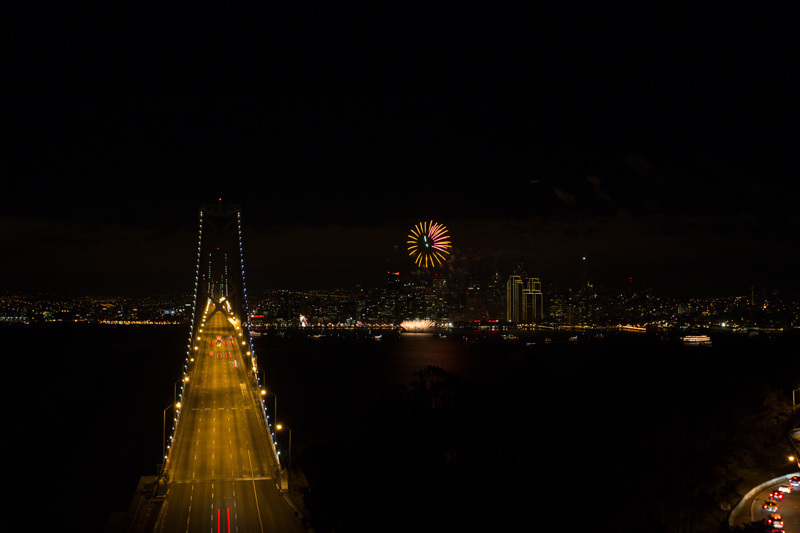 This photo, without fireworks, will be the one that takes up most of the final composite. You want to take your time and make sure you really nail it. This will be a normal nighttime long-exposure of the scene in front of you, so it will take some trial and error to get it right. Most likely your aperture will be anywhere from f/11 to f/18 and your shutter speed around 30 seconds to one minute. Keep that ISO low to prevent noise, and turn on your long-exposure reduction. Once you lock in your composition and get the photo, don't move your tripod. You need to capture all of the firework photos in the identical composition, so tell that drunk guy next to you to stop kicking your tripod. You got your long exposure of the scene nailed down and now it's time to wait for the show. While you are waiting, make sure to turn your long-exposure reduction back to off. 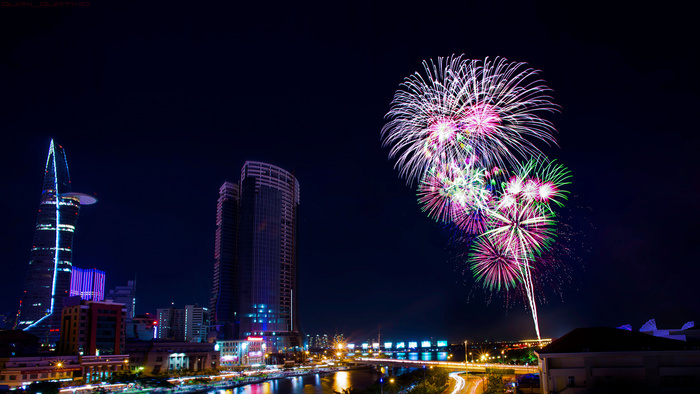 You need to photograph the fireworks in quick succession, and leaving this setting on will prevent you from getting lots of good shots. Also while you are waiting, get your remote release out if you have one. This is a valuable piece of equipment to have, but not necessary. 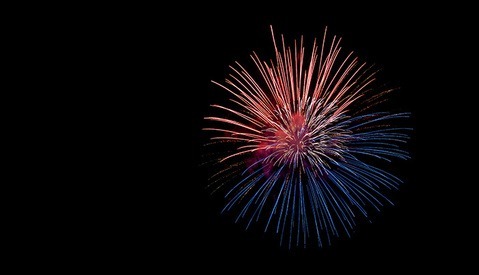 If you do have it, you can put your camera on bulb mode and simply hit the shutter when a firework is launched, then release the shutter after the firework has exploded. The remote release will help prevent camera shake that occurs when you hit the shutter on the camera. If you don't have one, then you can either shoot on bulb mode with your finger holding down the shutter, or set your camera on a two second timer with a set shutter speed, and fire off one photo after another. The disadvantage of this way is that you need to set the shutter speed in advance of the show, since you won't be manually controlling it in bulb mode. Generally, Harriman suggests trying to get your aperture and ISO set so you can effectively take well-exposed photos of the fireworks from a quarter of a second up to two seconds. 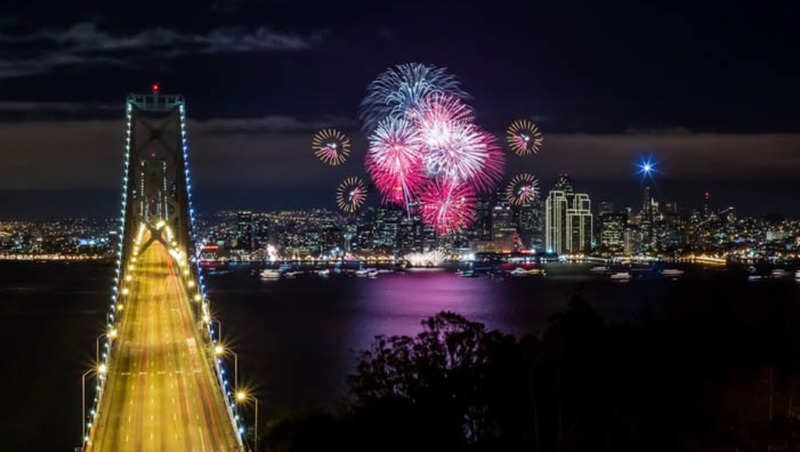 Luckily, firework shows usually last about 15 minutes, and the end is always the best so you have a minute or two of the show to dial in your settings. But Toby provides a pretty good starting point for testing of f/5 to f/11 and ISO 400. 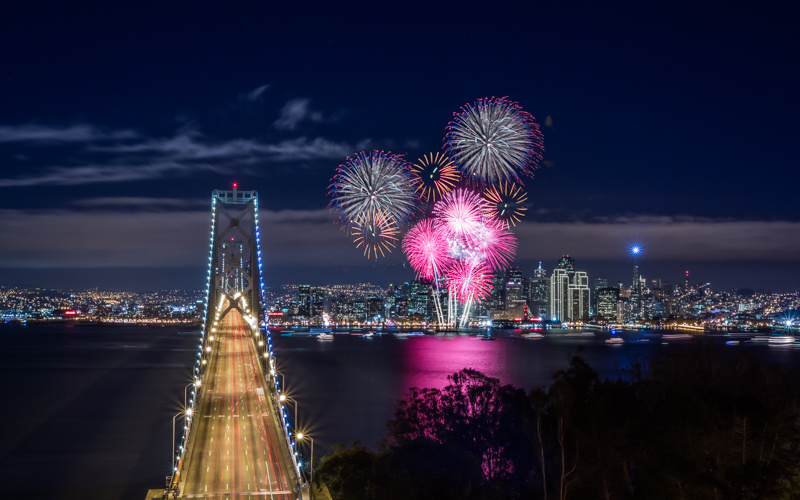 While the fireworks are exploding and you are triggering your shutter, remember to not move your tripod or camera! So now the show is over, and you head to your car to wait in an insane amount of traffic to get home. 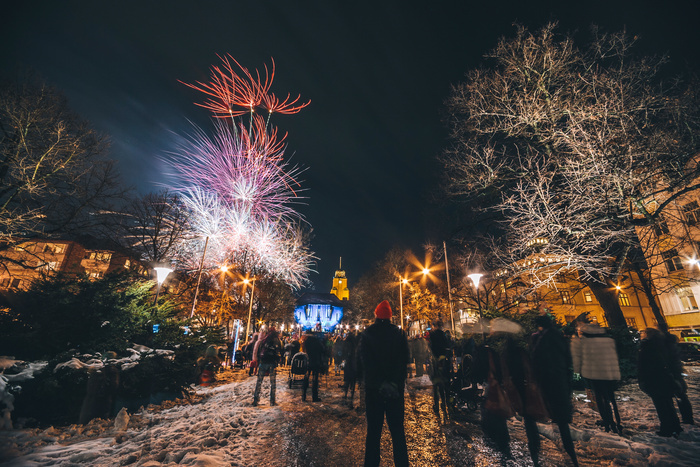 Once you get home, how do you use all the photos you captured to create an exciting firework photo you will be proud to show off? 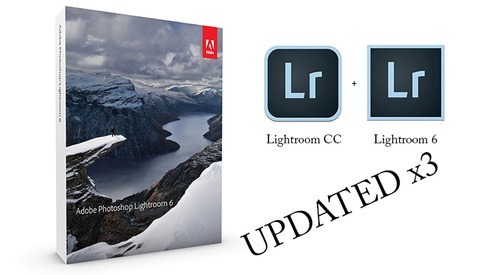 Harriman walks us through his Photoshop workflow. 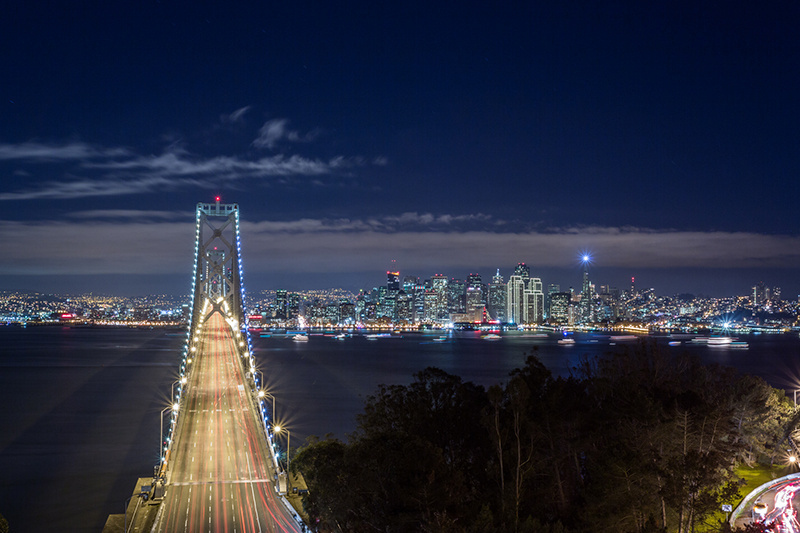 Here is my shot exposing for the city, don’t mind the crop as I will crop later to get rid of the bottom right corner. I did touch this shot up a bit before hand with Lightroom though. I did some basic exposure, contrast, white balance, highlights, shadows and lens corrections. Start by opening this shot up in Adobe Photoshop. 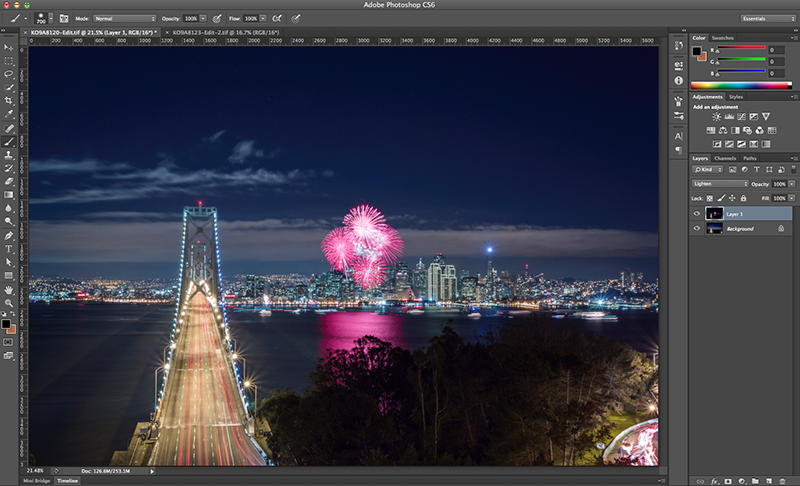 Shot exposing for the fireworks. Open this shot in Photoshop as well and bring it into the Photoshop file with the main shot. Make sure the fireworks are on the top layer and that is the layer selected. 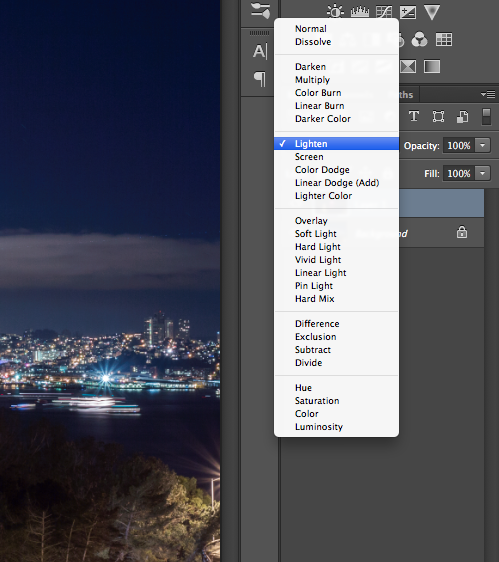 You will then select “Lighten” from the drop down menu as shown below. 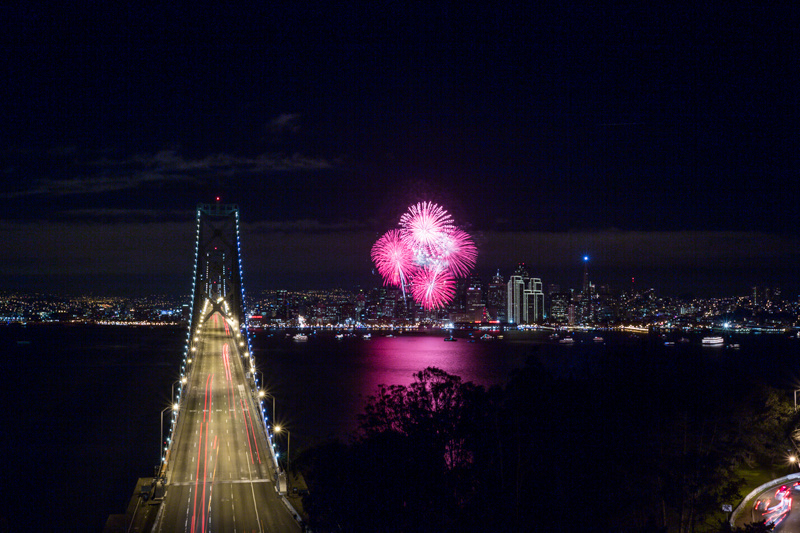 You should notice that only the bright areas of the photo show, AKA the fireworks. 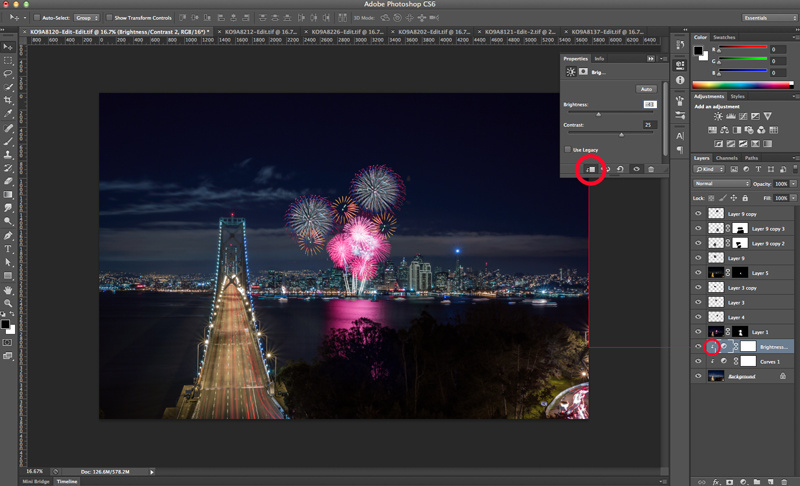 If the photos where not lined up the same, you will notice that lights from the bridge or buildings show a doubling (3D) effect, you can fix an issue like this by creating a mask and painting out all the areas around the fireworks, or by erasing everything around the firework area. I then found a few other shots which I thought would fit well with the overall image. Shown below are the three images I chose. I can now put each of them above the other two layers and also set them to “Lighten” mode. The first thing you will notice is that one firework is hidden behind the others in a not so pleasing way. Because I am already photoshopping this shot, why not move things around to make it visually more pleasing. So I move them around and even add an extra one sometimes to create your own little firework show. Why not? At the very end I decided that the main shot was a bit too bright so I brought down the brightness and played with the curves in an adjustment layer. You will notice next to that layer there is a little arrow pointing down. That is because I wanted these adjustments to only affect the main layer and not the firework layers. How to do that is shown below. Locking adjustment layer to just the background image. 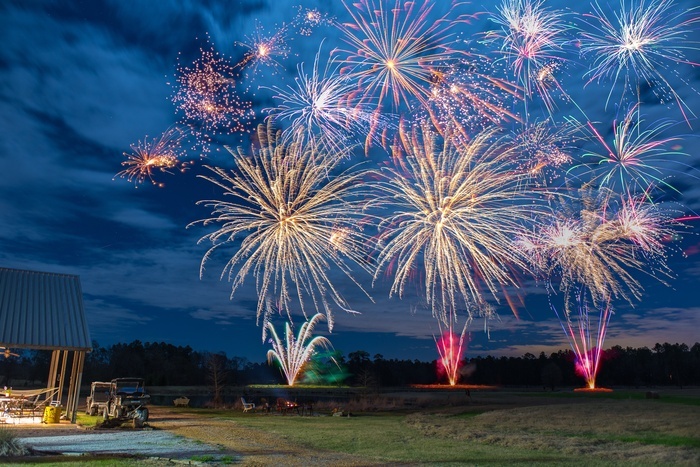 Toby returned the next year and captured the fireworks in a panoramic image. 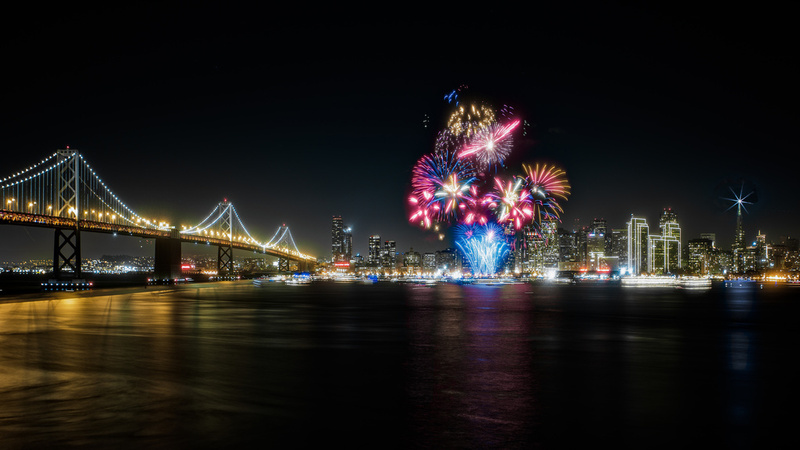 After reading Harriman's easy to follow tutorial, I went out and captured this photo of the fireworks show in San Francisco. 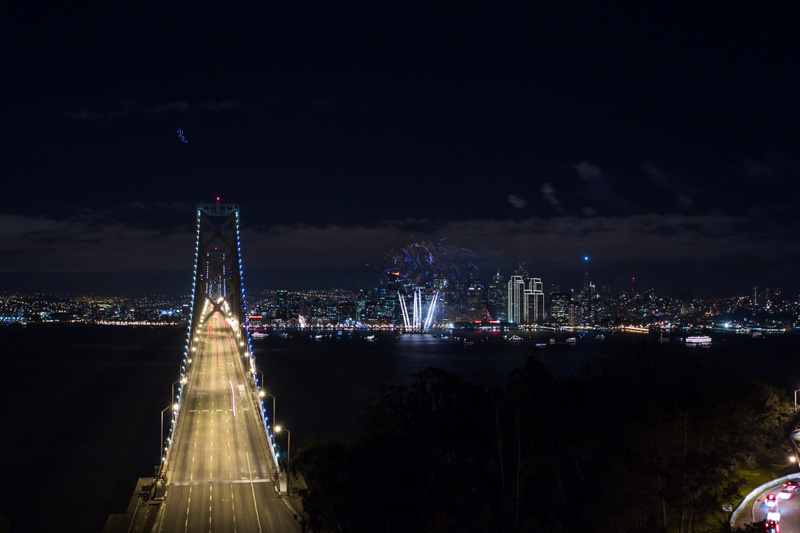 All photographs used with permission from Toby Harriman. You can view the original tutorial on Planet Unicorn. Lima Bay - Peru a couple years ago! This was very helpful. Thank you! My photo isn't nearly as amazing as the examples but I'm still pretty happy with it. I really love this shot Mika! I've taken some fireworks photos using my Canon A-1 (yes, it uses film). I've set the shutter speed from 4 to 30 seconds. To eliminate any shaking of the tripod, I used a self timer of 2 seconds to fire the shutter since I didn't have a remote shutter or a cable release. Even though I used a tripod for the fireworks, there was still some camera movement because I was on a pontoon boat floating on a lake and waves played a factor. So, how did the photos turn out? Okay, here's the Flickr album from July 2002. There's movement, but that was because of the lake; If I were on solid ground, it would've been different. First try at this. From last night.